WebCT - What is it? Section 1.3 - WebCT - What is it? WebCT (World Wide Web Course Tools) is the application TAFE SA has adopted for online courses. 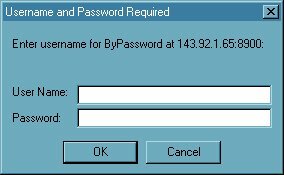 It is a computer program (or more correctly, a set of computer programs) that runs on our web server (we know this web server as 'baarnie', or http://www1.tafe.sa.edu.au, or http://143.92.1.65 - all these names refer to the same server). WebCT allows us to create 'web sites' for TAFE SA courses. 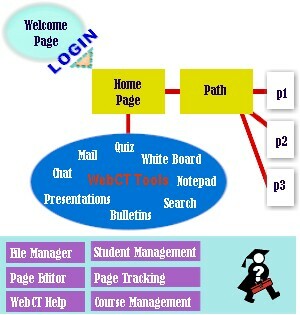 This course is an example of a WebCT site. Each site is self-contained, secure and can be customised to suit the needs of the course. You might think of WebCT as a TAFE college in 'cyberspace' with individual classrooms for each course. A WebCT site is 'built' and maintained by a developer and the site is managed by a deliverer (sometimes referred to as a facilitator or lecturer). The deliverer may enlist the assistance of markers or tutors in managing the course. Students (or participants) enrol in each course and are given a login and password to access the site. Each WebCT course site (often called a 'shell') can use a number of pre-existing tools. The developer (and course facilitator) can choose a selection of tools that are appropriate for a particular course. In addition, WebCT includes a File Manager. Teachers and students can store files on the web server. The File Manager tool helps us upload, download and organise these files. WebCT also includes a Student Management tool that allows us to add and manage classes of students and a Quiz tool for creating and managing online assessments. a Welcome page, which sits 'outside' a WebCT site (it is visible to the internet without a login). It is the front door to the course and usually contains information about the course and a login button. a Home Page, which acts as a control centre for the rest of the course. It is the 'launching pad' from which students gain access to the pages and other tools that are used in the course. a number of course tools. It may be helpful to see a simple diagram of the structure of a WebCT site. Click on the following thumbnail image to see a larger image of the diagram. During this course we will only be examining some of these tools. Later courses will provide more detail.